This Joomla! 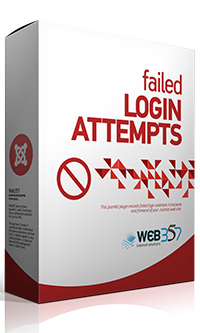 Plugin records the failed and successful login attempts into the back-end and front-end of your Joomla! website. It is useful for security purposes and serves as an information pool to track malicious user access (IP, country, browser, OS, etc.). View Demo »Try FREE versionBuy PRO version! ^ Functions Improved: The getOS() and the getBrowser() functions have been updated to get the most recent Operating Systems and Browsers. # BUG Fixed: The datetime gets now the correct offset from the joomla configuration. # BUG Fixed: The modal behavior is missing. Now the logs are displayed properly in a modal popup window. ^ The Demo and the JED link have been updated in the description tab, at Joomla! backend.
! The Web357 Download ID parameter field has been deleted from each extension settings and has been replaced by a unique API key parameter field at the Web357 Framework plugin settings. + A new button (Settings) has been added to the description tab at Joomla! backend. ^ Compatible with the latest version (1.6.0) of Web357 framework plugin. + New Parameter: The "Fix Ordering" button has been added. Sometimes you need to click on that button to make sure that the plugin has been set as a priority between other authentication plugins. ^ The mail() php function has been replaced by Joomla's api function JFactory::getMailer. ^ The "footer" element has been changed to reordering the plugin, for the right storing of  "Successful login attempts". ^ Direct notifications are now available in the FREE version. ^ Save Logs to Database are available only in PRO version. ^ Minor fixes in language file. + Compatible with 'Web357Framework' (joomla! system plugin). + One mysql table has inserted and now the data will be stored in the new sql table named #__failed_login_attempts_logs. + FREE and PRO version are available. # Bug Fixed: Date is always showing 11th, in log file. Enable logs for backend (Store the Failed login attempts of joomla! backend). Enable logs for frontend (Store the Failed login attempts of joomla! frontend). Successful Login Attempts (Store the Successful login attempts of joomla! frontend). Direct E-mail Notifications (Receive direct notifications via email about the Failed and Successful login attempts of joomla! backend and frontend). Store Logs in the Database (Store all, successfull or failed, login attempts in the database). The functionality is good. The extension log all kinds of info of login attempts. I like the technical info about the used browser/os Using the plugin is very easy. Switch functions on/off to your desire. Viewing the log files through the plugin doesn't seem logical. The most important part of an extension! I had initial problems with notifications of successful logins, but builder solved this within a day. With a subscription package, you get our professional support and full access to all downloads and updates of this extension. Great value for a low price! Try FREE version Buy PRO version! Get ALL Web357 Premium Extensions. 1 Year access to Premium Updates and Support Area.